This is the headline of one of Carla Guagliardis comments to her work and it mentions two important aspects: time and space. They are not only an immanent part in their physical dimension but find their meaning in various levels. Like a brush or colour for a painter, for Carla Guagiliardi various materials like water, iron, glass, copper, steel, cotton or bands of latex itself are essential means in the creation of her works. Carla Cuagilardi combines the above mentioned materials in different compositions, so that in their combination with each other as well as with time and space they react in different ways. 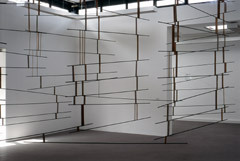 In the installation “O Lugar do Ar” (The place of the air) a labyrinth is build up from bars of irons, which are up to 220 cm long, and which are hanging from the ceiling being hold by elastics of different sizes. While the space is defined through the horizontally lined up bars of iron, the time is defined through the bands of latex, which expand in the verticallity. 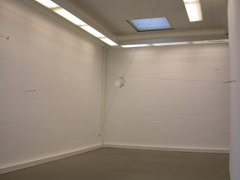 Like all of Carla Guagiliardis works this installation goes far beyond its mere physical and material qualities. Carla Guagliardi transfers her perception of human situations like uncertainty, instability or imbalance into extraordinary poetic images. In her sensitivity for different kind of materials and their combination she finds very exciting metaphers for moments of vulnerability, change and confrontation. Transfered into her installations and assemblages they can be experienced in physicall as well as in psychological perception.